This is a piston design recirculation valve that is a direct replacement for the original fitment. 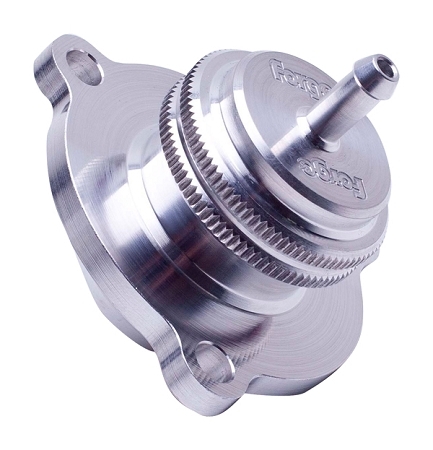 This valve gives greater longevity than the diaphragm (OEM) valves but also benefits from its ability to be fitted with different springs when the boost pressure has been increasded or the engine has been modified. To ease installation the top or vacuum connection is angled. The quality of this by-pass valve is outstanding! It looks and functions great and when you remove the factory BPV you appreciate it even more, all billet aluminum vs plastic and rubber. The sound of the Forge BPV is great as welll, similar to the stock BPV but a little louder when letting off of the throttle. BNR thanks again for the great customer service and parts! I look forward to doing business with you again. Just a heads up to anyone wanting to DIY. This thing is a pain to install. Its bad enough that the stock BPV is just three loose pieces held on by three torx screws and just taking it off will test your patience. This one is more solid and admittedly easier to install than the stock, though there shouldn't be any reason to other than maybe warranty claims. Still, it can be a pain since the O-rings sit in their grooves quite loosely. As a precaution to not loose your ring down the intake tract or have it not sit properly and create a leak, use a little assemblers grease or maybe some rtv to hold them in place. Overall, however, its a great product. Also note, its slightly taller so the BPV line's rubber part will contact the wiring underneath the turbo, but from my use, it hasn't scuffed or cut the BPV rubber line at all. First off awesome customer service and fast shipping! The Forge bypass valve is beautifully machined. Installation is simple and fits perfectly. Changing the internal spring is a breeze. It does as it claims it definitely holds boost pressure better than the plastic bpv. And sounds great when you let off the gas you get the "pssshh" sound! I purchased this product and its amazing! More crisp sounding and a much more solid piece that the stock one! Great product! Easy to install, looks good, and sounds good. I get compliments all the time! Thanks BNR!